Each fall I sift through my gift closet with anticipation. What giftable treasures have I picked up at summer yard sales? How about those clearance deals put away for Christmas? What do I have? What do I need to find before December? I usually just sort and label, but today I thought, why not go ahead and wrap? Above, boxes of 8 taper candles were marked $1 at a super-clearance outlet. Mom bought a gorgeous apricot shade for each aunt. You won't find gifts wrapped in comics here. My theory? The cheaper the gift, the more care one should take in its wrapping. Giving an Ipod? A grocery sack will do. But a pretty presentation can make even a humble gift seem special. I never fail to find leftover papers and ribbons at yard sales. This unopened roll of Hallmark damask cost a quarter; the blue ribbon, $1 for 50 yards. (Even with my generous bows, it's lasted over 3 years). Here, I used a Mary-Englebreit mix of patterns: 25-cent gingham ribbon, more of that church sale Hallmark paper, and a rich Caspari card as gift tag (from the thrift shop, 59-cents for a box of 20). What's inside: Among other items, $3 Martha Stewart DVDs. Our Dollar General just set out Martha's Christmas and Thanksgiving DVDs for the same price. These are just gorgeous. Im the worlds worst at gift wrapping and Ive even taken classes on it. I still cant do it! I am with you...if the wrapping is gorgeous, then it's almost better than the actual gift. Thanks for the tips! Oh, I'm going to have to hit Dollar General again! I have loved having the other DVD's on hand for gifts that you pointed me to around Mother's Day! Thanks for the tip! Your packages look gorgeous! A beautifully wrapped package is a gift in itself! Georgous and inspiring! Thank you! I usually buy wrapping paper when it is on sale (like after Christmas) or at Goodwill. However, I have a huge roll of brown craft paper left over from our move 2 years ago and started wrapping presents with that. Combined with some nice ribbon (bought on sale or at goodwill and yard sales)it makes for some nice look packages. The plus is that is works for all people, ages, and occasions. I am the girl who sold all of her wrapping paper at a garage sale! I was moving and I just couldn't justify moving it across country. Also for me, in a smallish LA apartment, everything we save is *with us* all the time. So, I have pared down wrapping paper almost entirely. Now, I save one bag of gift bags that seem to come to me and get recycled in just the right ratio. At Christmas I buy one roll of paper (usually Costco) and use it all up. I think it is thrifty because real estate is pricey and we need to think about the value of things stored vs. the real estate those stored items claim. I'm big on having beautifully wrapped presents. I've bought gorgeous papers at Target's dollar spot and IKEA. IKEA charges about $1.50 for fat rolls of wrapping paper. And they always have big rolls of brown paper that are great for crafts or wrapping gifts. I buy ribbon (real ribbon) inexpensively at fabric and craft stores. A big $3 roll of tulle is a very simple way to make gifts look gorgeous, and the roll lasts a long time. Lovely gifts both inside and outside! I wrapped my first holiday packages earlier this week. I like starting early so it's fun and not stressful! Simply beautiful. Well done, Meredith! Your blog is always full of the best and most beautiful photos. Thanks, too, for the dvd tip. I'll be heading to Dollar Tree! I love your gift giving ideas!! Thanks so much for sharing them. 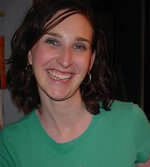 I have gained so many new idea's just reading your blog. 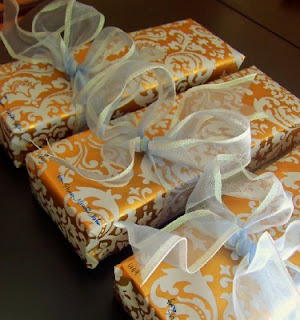 I love the wrapping paper - and the purchase adn store gifts that you share about! Beautiful! I am curious though how you store them so that the bows don't crush. I have that problem also when shipping the gifts...maybe these all are for local delivery. Between your suggestions and reader's comments I'm thinking the cure to my gift wrap lameness might be brown craft paper and assorted ribbons. What a great point! 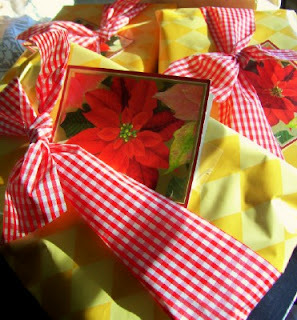 Pretty gift wrapping *does* make a difference!